The bill became contentious last week when the language "terminates a human pregnancy" was replaced with "causes the death of an unborn person." A House subcommittee has advanced a bill (SF 523) that would increase the criminal penalty for intentionally or accidentally causing the death of an “unborn person.” It was the first opportunity for supporters and opponents of the proposal to weigh in on controversial language defining an unborn person as starting at conception. Under the measure, some people convicted of killing an unborn person could receive a life sentence. Supporters said it is an appropriate punishment. “A woman should know that the perpetrator will receive justice, the same justice a person would receive had they killed the woman’s baby outside the womb,” Kathryn Kueter of Concerned Women for America of Iowa told the subcommittee. Subcommittee members Steven Holt (left), Dustin Hite and Beth Wessel-Kroeschell listen to testimony from supporters and opponents of the fetal homicide bill. The original bill brought up for debate in the Senate was viewed as a bipartisan measure. Then an amendment changed the language to refer to an unborn person defined from “fertilization to live birth.” The bill passed the Senate with only Republican support. Critics argued at the hearing that if the bill’s definition of personhood becomes law, access to abortion, birth control and even in vitro fertility treatments could be threatened, although the bill itself is restricted to criminal acts that harm a fetus against the woman’s wishes. “Yes, it’s limited to the criminal code but this is a step in a much longer process of getting personhood and banning abortions,” said ACLU of Iowa policy director Daniel Zeno. Rep. Steven Holt, D-Denison, chair of the House Judiciary Committee, said the definition of personhood needs to be debated. “This discussion I believe lays bare the untenable position of those who continue to refuse to acknowledge that the entity growing inside a pregnant woman is a human life, a human being, an unborn person,” Holt said, adding that he supports advancing the bill. The bill advanced with support from Holt and Rep. Dustin Hite, R-New Sharon. Rep. Beth Wessel-Kroeschell, D-Ames, opposed it. The House Judiciary Committee must advance the bill by the end of the week for the proposal to come up for debate in the House. Republicans in the Iowa Senate have voted to significantly increase the sentence for anyone convicted of intentionally or accidentally causing the termination of a pregnancy against the mother’s wishes. Sen. Jake Chapman, a Republican from Adel, said a life prison sentence is “proper punishment” for such a crime. “It recognizes that is a person in the womb and, as such, should have rights,” Chapman said. Last week, the Iowa House voted in favor of a constitutional amendment that would automatically restore voting rights to Iowans with felony convictions. It’s the first step in a long process. Morning Edition host Clay Masters talks with state government reporter Katarina Sostaric about this issue. 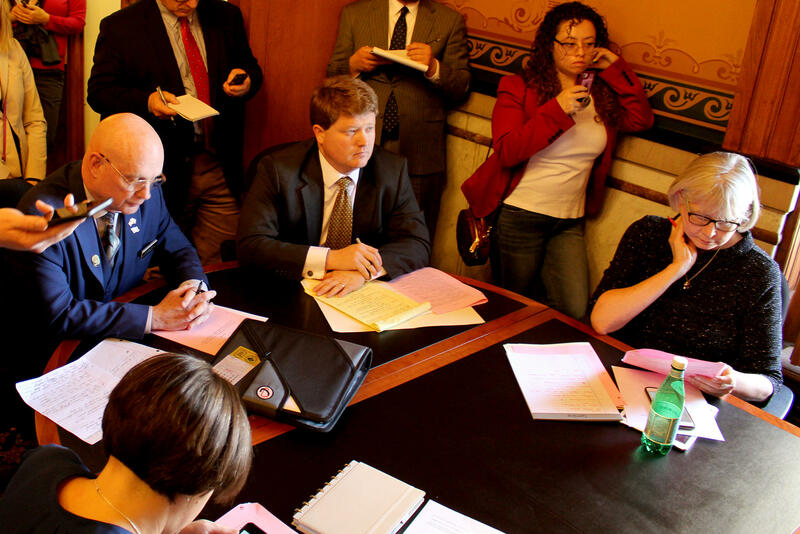 They also discuss Governor Reynolds' birth control plan and the "personhood" bill in the Senate. Over the weekend, several Democrats running for president in 2020 visited Storm Lake to participate in a discussion of rural issues called "The Heartland Forum".